The actuarial profession is entering a period of continuous change and growth; driven by an ever-more diverse and globalised marketplace combined with the rapid pace of technological change. We believe that now is the time to ensure our members have the skills, qualifications and support they need to fully grasp the opportunities of this new professional landscape. So the IFoA has embarked on a proactive programme of activity to update the education we offer, the regulation we provide and the global communities we support. Driving and guiding this programme of activity is the passion and pride of our members and their commitment to ensuring the sustainability of the actuarial profession. Over the past year, I have been privileged to be able to listen to, consult on and discuss the way the profession is evolving with members at all stages of their careers. I have listened to students who are just starting out on their journey to becoming qualified actuaries and analysts. I have also heard from IFoA Fellows with decades of experience gained at the highest levels of our industry. One thing comes through loud and clear from these discussions: members feel enormous pride in being actuaries and belonging to our global actuarial community. We're meeting the challenges of this period of transformation head on with a programme of innovation and evolution. Our goal is to build on the great pride and passion our members feel in their profession, whilst ensuring we are flexible and responsive to the changing needs of employers, governments and societies world-wide. 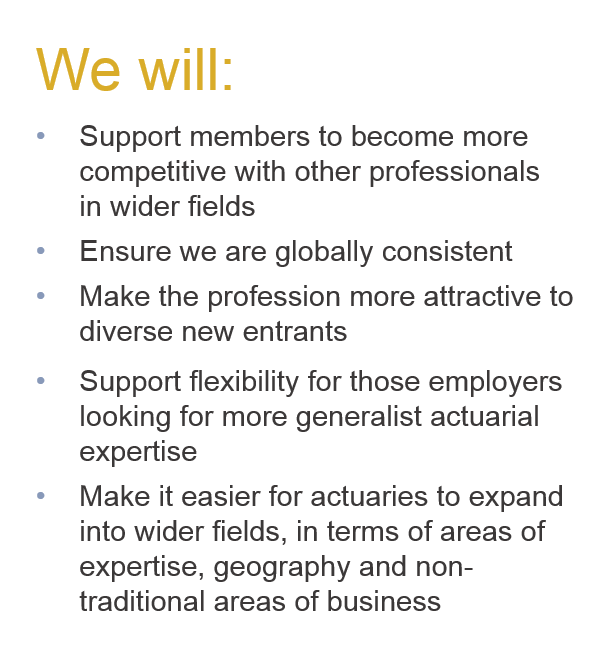 By doing this our goal is to ensure that actuaries remain at the heart of modern business practice for years to come. We have already laid the foundations for a globally relevant qualification framework in the introduction of Curriculum 2019; ensuring the qualifications of our members will be valued wherever they work. We are introducing innovations in regulation such as the newly globally launched QAS programme as well as providing a host of lifelong learning and engagement opportunities for our members, no matter where they are on their actuarial journey. Most recently we updated our qualification framework, positioning Associateship as the initial destination for students before becoming a Fellow – if that is their ultimate aim. Those who are currently studying will not be affected by this change, although if they would like to gain the Associate qualification before working to Fellowship they will be able to do so. Finally, we consulted on the rebranding of the IFoA Associateship qualification as 'Chartered Actuary', to ensure the proper value was attached to the qualification and that employers can quickly identify the skills they need - without compromising on standards. In early 2018 we began consulting with our members about proposals to re-brand the IFoA Associateship qualification as Chartered Actuary. You can find details about the Chartered Actuary consultation here. There was particularly strong support for all the proposals from employers, industry bodies, other national actuarial associations, as well as from Students and Associates. However, 60% of Fellows responding through the online survey expressed concerns about the proposition for the Chartered Actuary title change. A number of respondents also had reservations about the proposal to require all future student members to become Associates before embarking on further advanced examinations towards Fellowship. These responses from the consultation have been heard and have played a decisive role in helping us to shape the future of our qualifications. The IFoA recognises more clearly Associates as fully qualified actuaries and will position the qualification in line with the International Actuarial Association’s (IAA) global standard. Any new students embarking on their studies under Curriculum 2019 will be required to reach Associateship before proceeding to Fellowship if that is their preferred route. However, because of significant feedback received during the consultation, students will be able to sit some of their advanced examinations pre-Associateship if they choose to do so. We will continue to consider the designation Chartered Actuary (CAct) as a rebranding of our Associateship (fully qualified actuary) member grade, but undertake to clarify Council’s thinking on the competencies of CAct and CAct/ FIA/FFA and directly address the concerns expressed by Fellows. IHelena Ingram, Matt Saker, Michael Crawford and Louise Pryor talk to Chris Seekings about how the profession is evolving and share their thoughts on the IFoA’s plans for a ‘Chartered Actuary’ qualification. IFoA Council Member Charles Cowling describes how the actuarial profession is moving forward, with recent initiatives at the IFoA helping to ensure it maintains its relevance and sustainability. Chartered status is widely recognised as a mark of professional competency and is awarded to individuals by Chartered professional bodies and learned societies.